There may be finer desserts in the world, but since my first trip to Vancouver Island in 1999, I will kill for a Nanaimo Bar. They are unheard of in the U.S., much like hard cider, which Canadians also love. But as far as I’m concerned, Nanaimo Bars ought to be in every cafe in the U.S. They should be as ubiquitous as brownies, another bar made in pans. They are sinful, and you can feel your arteries clogging up just looking at them, since they are pretty much all butter and chocolate. A small, rich square goes a long way. 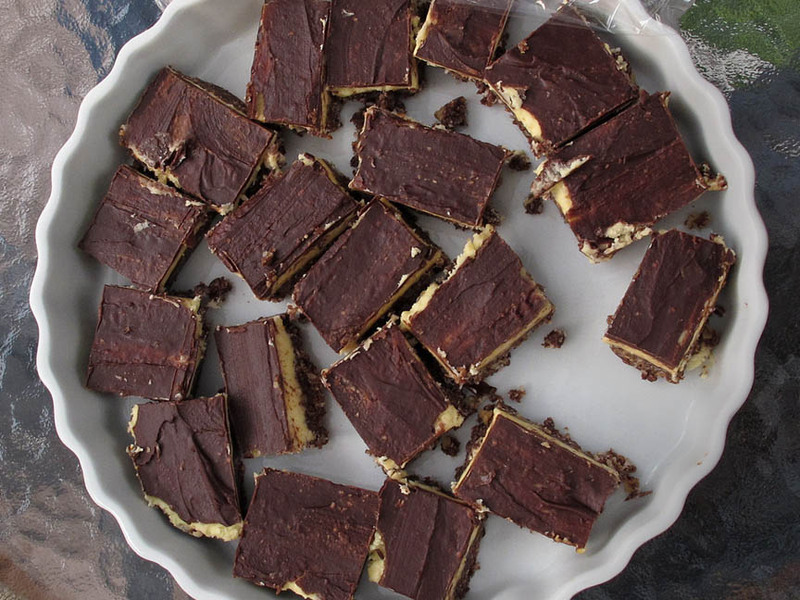 Louise Rayer Johnson's Nanaimo Bars! When people ask me, “What’s a Nanaimo Bar?” I say this: It’s a triple-layer bar made in a 9×12 pan with a bottom layer of cocoa, graham cracker crumbs, coconut and almonds, a middle layer of pretty much solid butter and a top layer of pretty much solid chocolate. You assemble the layers, put the pan in the fridge to harden, cut the resulting dessert into small pieces and stand back. 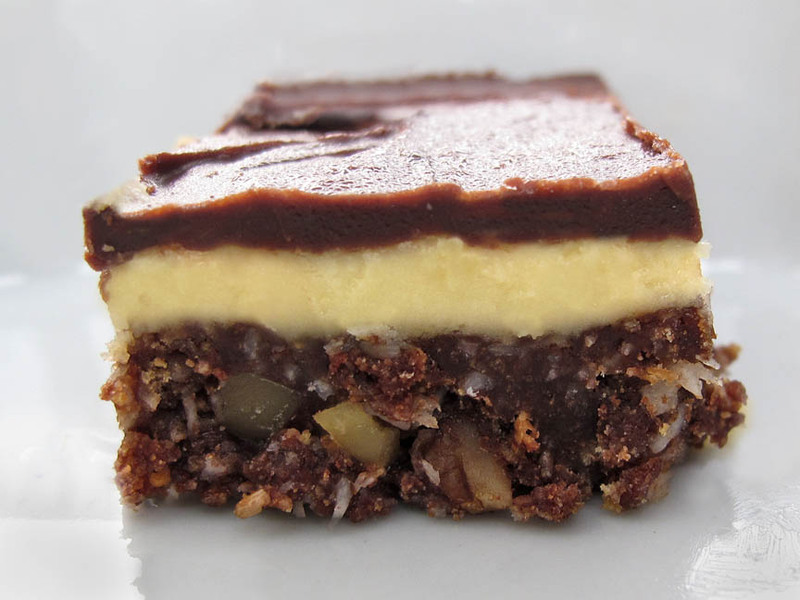 You hear some serious moans of pleasure coming out of people mmmm’ing and ooohhhh’ing over Nanaimo Bars. Tonight, Louise Rayer Johnson hosted the Schmidt siblings and some of her family members as part of the 50th anniversary when the two families gathered on Vancouver Island. Louise, bless her, made Nanaimo bars. Though I’m not eating much sugar these days, I sat there and nibbled on two tiny bars, doing my best to make them last as long as possible. Happy tastebuds! My mouth was aching with pleasure. Other unconfirmed sources say the recipe dates back to the 1930s when it was known as “Chocolate Fridge Cake” (they’re not baked, just assembled and set to cool in the refrigerator). Anyway, it doesn’t matter. Nanaimo Bars are as much a part of Canada now as the maple leaf, and I say, “Bravo!” Bless Canada and Mabel Jenkins and perhaps the other unnamed progenitors of what has become my favorite dessert. And thank you, Louise, for your very fine Naniamo Bars! Yum!!! You can now get Bird’s Custard powder in the import section of Raleys and Bel air. Also at World Market – Cost Plus. Right! I remember the BF telling me this… so whew! You don’t have to go all the way to Canada for custard power! Thanks, BF!